Pets are like children. They require individualized care, nurturing, and attention. Our highly qualified kennel attendants do the same with your pet while here. We provide tender, loving care, such as brushing and cuddling. To keep your dog happy and active, we offer supervised playtime. Food is included in the cost. We use a combination of Prescription Low Residue dry and Hill's I/D canned. The dry/canned combination makes it more palatable and gentler on their digestive system. Each run contains a drop down bed. Your pet will have access to our play yard or walked outside a minimum of four times daily. 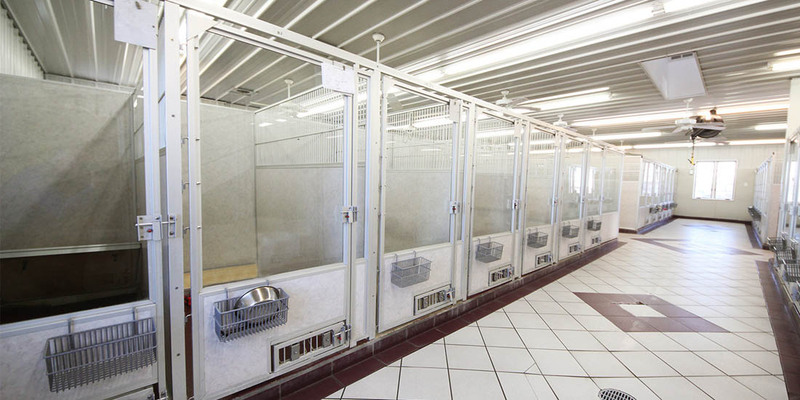 During the time outside, their kennel is cleaned and sanitized. Professional grooming is available at our facility. These services are separate from the kennel and are by appointment only. Due to loss and damage, we will no longer accept personal pet food bowls, bedding, and/or crates. Beds are available to rent from Tender Care. Capstar is a chewable pill used in the prevention of fleas. It is a per visit requirement in our facility during the months of April through November if using a topical flea preventative. We understand that all pet needs are not the same, so additional ala carte services are available for those pets that need a little extra attention. We offer several options of bedding such as a water repellent orthopedic bed that we recommend for arthritic pets. Please ask about all of our bedding options. Medications and dosage information must be provided at the time of check in. For specialty breeds that tend to mat or for the pet that just likes a little extra attention, our staff would be happy to brush them as you request. You bring the toys (limit 2) and we will provide the fun or attention for those that need a little "one-on-one". At the end of your pet's stay, our kennel staff will have your pet bathed, brushed, and ready to return home. Complimentary bath is included with a reservation of three or more nights of boarding. "I have 4 dogs and inspected other vets/boarding before I settled here. I'm so happy I made the right choice! I never boarded my dogs before as I'm discriminating about leaving them & I called daily to check on my fur babies on a recent family vacation. The staff was wonderful in keeping me informed of their status which helped me to feel they were in excellent hands! I have had them in for wellness checks, meds, & procedures & am confident they have received excellent care. Both Veterinarians are animal people and take time in the examination room to soothe my dogs & explain procedures to me as well. My dogs are groomed there as well by Debby who always makes them look fantastic. Tender Care is a well designed and very clean hospital and the newly landscaped grounds are very welcoming! I am grateful to have found them!" - Judy S.